I never ever thought I’d hear anyone say “Sapir-Whorf hypothesis” in a movie, but I heard it in Arrival! Ok, it was a science fiction film. See trailer here. Linguistics professor Louise Banks (Amy Adams) is asked to help the United States communicate with aliens, and she’s the one who talks about the Sapir-Whorf hypothesis. I liked the movie, but something inside me made me wonder how it would have been different if Professor Banks had been fluent in Pittsburghese. See yinz. 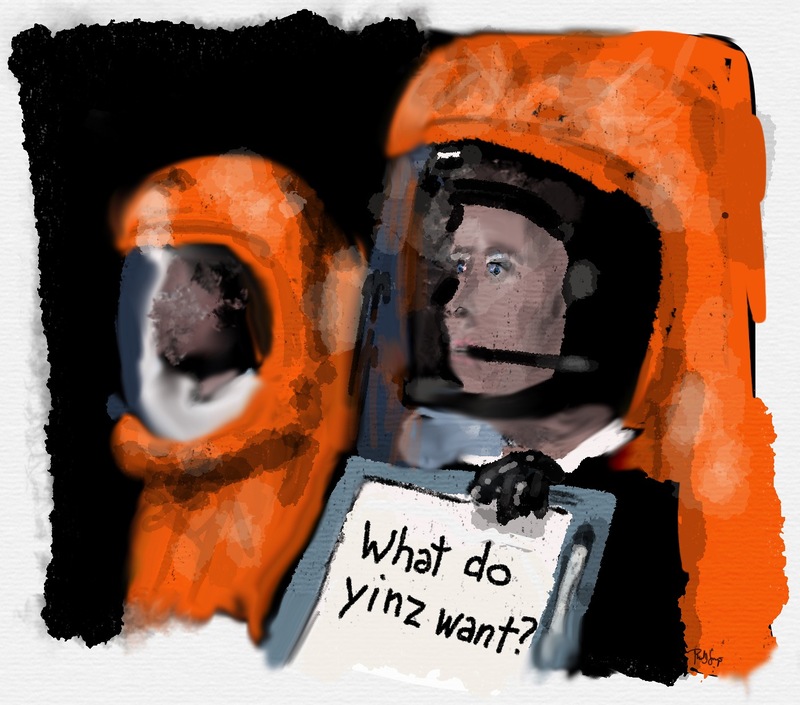 This entry was posted in Cartoon, Digital Artwork, iPad Art, Sketches and tagged Arrival, linguistics, Pittsburghese, sociolinguini, sociolinguistics, Tayasui Sketches, yinz by portfoliolongo.com. Bookmark the permalink. Oh, I’d like to see that movie! Love all the links! A great drawing as well. I have a book, which I find fascinating, called “Language, Thought and Reality” with the subtitle, “Selected Writings of Benjamin Lee Whorf” – edited by John B.Carroll…. a thoroughly intriguing read… What a wonderful post, Paul, thank you! Thank you, Janette. Let me know when you see the movie. I’d like to know your take. Yea, language is quite a key! You’re a poet, and I’m telling you?